April 11 to June 29, 2014, 9-7 daily. 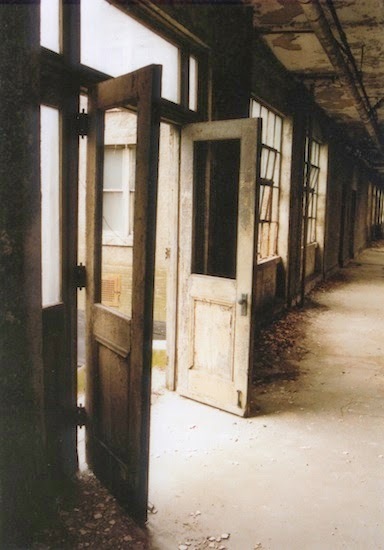 In early 2002, Paul Margolis photographed the interiors of the decaying buildings on the un-restored south side of Ellis Island. They had a haunting beauty, with their subtle, almost monochromatic colors: greens and rust, old brick and peeling plaster. While the buildings have been sealed and stabilized since he photographed them, restoration efforts are slow and require millions of dollars. The Great Hall and attached buildings on the north side of the Island were restored and made into a National Park and museum of immigration in the 1980s. The south side of the island, however, has been left largely untouched for six decades. The buildings on the south side served prosaic and often sad purposes: they were the wards and medical facilities. But they also tell the story of hope and resolve; the less known history of those who voyaged to the New World.